When it’s time to bring everything together for greater efficiency and cost savings, the UniPay gateway is ready to meet your needs. As a modern payment processing solution designed with the wide and diverse needs of today’s companies in mind, we’re here when you’re ready to bring your departments, divisions and subsidiaries together with a single payment system. If you’re an enterprise-level company with departments, divisions and subsidiary companies that evolved independently and don’t necessarily work together, we can understand why each would have developed its own payment processing solutions with a variety of partners and providers. As you move forward, however, it may be time to move up to a single payment processing product that can unify your company and perhaps save you on fees. Because your transactions are divided among different products and providers, you may not be getting the best rates. While you may have the best deal possible with each payment processor, bringing things together on a single platform can qualify you for better volume pricing. Once the processor learns your total transaction volume is much higher than before because of consolidation, you can get a better rate. Then, you can bring all your transactions under the processor that offers the best deal and the most savings. When you choose to bring all payment processing together, you benefit in more than one way. You may be able to create better working relationships between departments and companies. You may also be able to create a workforce that’s better able to move throughout your company as needed since subsidiaries will share a common payment processing system. And there’s more. Choosing the right consolidated payment solution could bring better function to every department and greater ease for your staff, your clients and your customers. A modern payment gateway designed for today’s business needs and challenges is available. 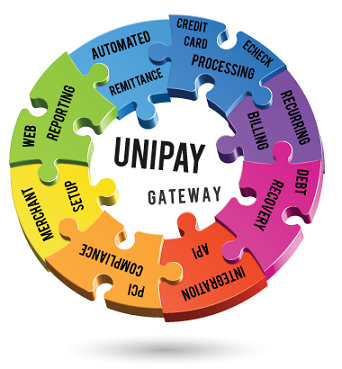 Let our team at United Thinkers explain the UniPay gateway to you. Our robust open source commercial software is fully customizable, full-featured and ready for even the most advanced payment needs. Let us help you prepare a strategy for unifying your enterprise’s payment processing with the UniPay gateway. Please contact us to set up your appointment. Consider the idea of payment processing consolidation with UniPay Gateway Platform. Are You Ready to Own Payment Gateway?